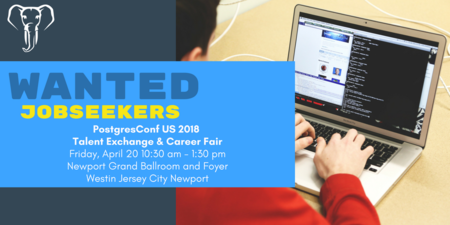 In support of our theme of "People, Postgres, Data", the PostgresConf US 2018 hosts its 2nd annual Talent Exchange & Career Fair on Friday, April 20, from 10:30 am - 1:30 pm. This event is free for job seekers and open to the public. Last year, the Career Fair brought together employers and candidates in one of the hottest career options available today, Postgres DBA.